For the people of China, red pomegranate is one fruit required in welcoming the Lunar New Year. They believe that the seeds of many a symbol of fortune that abound. 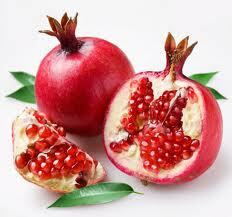 In Indonesia, red pomegranate is often planted in the yard as an ornamental plant as well as to eat. In addition, the fact this fruit has many health benefits that it contains substances that are healthy and able to prevent all diseases. For example, red pomegranate juice, if used to rinse the mouth before drinking, can help cleanse the mouth and teeth, and prevent infection and help eliminate bad breath odor. Meanwhile, eat slowly and remove red pomegranate seeds to clear up a hoarse voice and avoid the dryness of the throat. Other Benefits derived from the tannin content of substances that exist in this fruit, which they can anesthetize roundworms, pinworms, and tapeworms in the intestine, so that they can come out through the feces during defecation. In Egypt and Vietnam itself this is a common treatment.